For those of you who are still here with me this week, here's the Totoro cake. Isn't he freakin adorable? I made the base out of Scotcheroos (Are you tired of hearing that word yet? 'Cause it's starting to sound all weird to me. Like when you repeat something over and over til it loses all meaning. And it had already started out fairly strange to begin with.) He's mostly just cake and buttercream. The ears are gumpaste and toothpicks. The whiskers are toothpicks colored with black gel food coloring. And his nose, eyes and mouth are royal icing. Anyway, I made this bottom part and then Jeff made several chocolate cakes. Then I cut them into circles and layered them on the bottom with buttercream. Now here's the genius thing about using buttercream... it's all soft and easy to spread when you put it on, then you can put it in the fridge overnight (or just a couple of hours if you're really short on time) and it will totally firm up. This makes it so much easier to carve because, you know, the layers won't be all sliding around on you. I actually had that part done pretty early in the week. And he was just sitting there in the fridge waiting for the final, colored buttercream layer and decorations. It was at this point that the Catbus cake fell apart. And I totally lost all confidence in what I was doing. 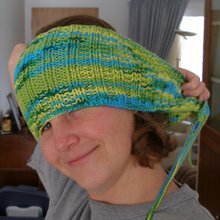 So, Saturday morning, instead of sucking it up and giving it a shot, I caved and called my sister. She'd done last year's monkey cake and has nerves of steel. Mine, on the other hand, were shot. Because there are very few things as disheartening as watching a birthday cake fall apart about 14 hours before the party. Yes, Jenny saved the cake. And it was awesome. And she is my hero. That cake is awesome! I love it. Looks like it was a fun birthday party. I love all of the things that you made for it. You are very talented. I too like the happy birthday sign, which I am assuming is in Chinese? Thanks so much you two. Gill, it's actually Kanji (which apparently uses Chinese characters for the Japanese language). OOOH!!! i LOVE this! it is SOO adorable. unfortunately, my girls really want to make this now and i don't have nearly the skills and talent you do! can i please send them to your house? i also love the 'tanjobi omedito' sign! so cute! Thanks so much for your ideas for a totoro party. I'm doing a totoro party for my 6-year-old on Saturday. 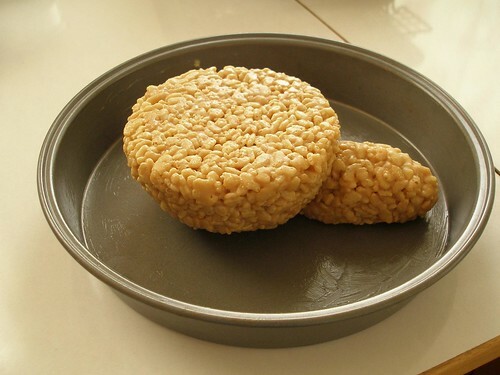 I've got my rice krispies treats base layer (peanut allergies, can't use scotcheroos) cooling now for the totoro cake. I dipped marshmallows in chocolate for the soot sprites, and I'm just not attempting a cat bus cake. 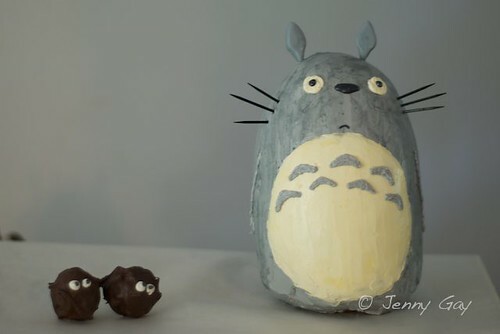 :) I am attempting a totoro pinata, though. I appreciate your creativity! Thanks for the great ideas. FYI, your blog came up first when I googled "totoro birthday party"
Oh my goodness, I love this so much. Miyazaki is one of my absolute favorite directors, and Totoro is a such a precious movie. You've done such a great job. How many layers did this cake actually require? The only way I can think of it being put together is by pilings layers on and trimming them to form the egg-like shape. And in my mind, that would take a lot of cake! I LOVE This! My 3 year old has begged for a Totoro cake. Do you have more pics of the process and some info on what size pans you guys you used and stuff? It came out Beautiful!! Thank you for posting it. Melissa, unfortunately, I didn't take too many pictures of this in process. It was all I could do to get it done in time. Basically, you form the bottom out of scotcharoos and then layer on round cakes of the same diameter, with buttercream in between. I didn't cook the cakes in a pan of the final diameter, but cut them down to circles after they were baked. 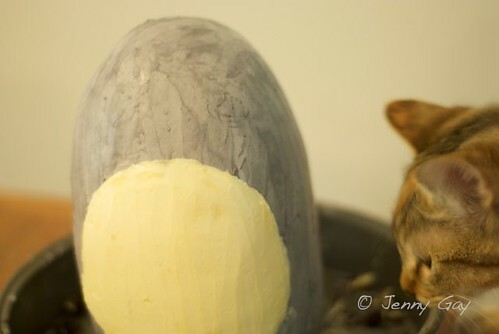 Then once I had the whole thing formed in a cylinder shape (and after it had firmed up in the fridge), I carved it to the final Totoro shape. Hope that helps a bit.